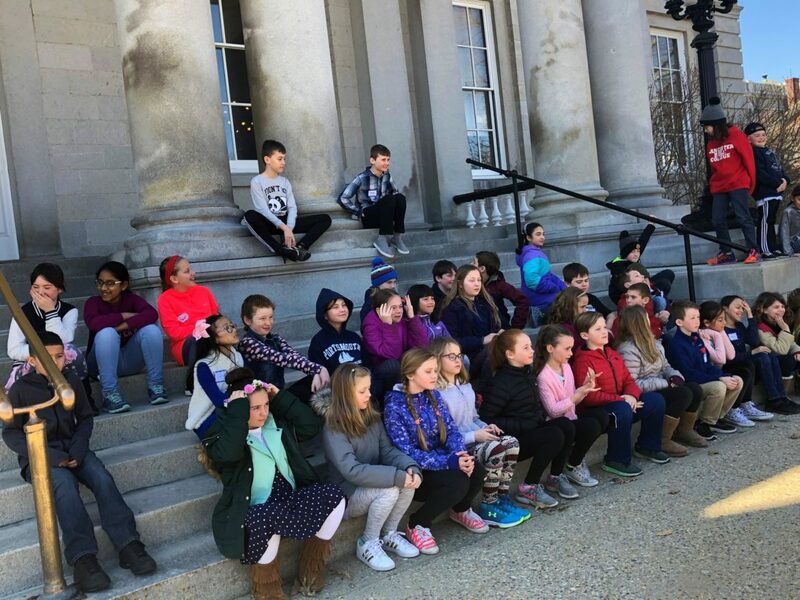 Little Harbour Elementary School students from Portsmouth visited the State House on Thursday. CONCORD – A bill that Republicans claim would end work requirements for the state’s 50,000 Medicaid Expansion recipients passed the Senate 14-10 Thursday with all of the Democrats voting in favor. The measure, which adds the allowance of state general fund revenues for the Granite Advantage health-care program, will go to the House of Representatives for consideration, while a federal lawsuit plays out on the subject. It is possible that Gov. Chis Sununu will veto the measure if it gets to his desk. “The work requirements are over,” said Sen. Jeb Bradley R-Wolfeboro, who called it a backdoor way of achieving what a federal lawsuit is trying to achieve. Democrats said Senate Bill 290 offers nothing but a contingency to protect coverage for the unemployed and if all goes as planned the bill will change nothing. Senate Republican Leader Chuck Morse, R-Salem, along with Bradley issued a statement after the vote. “The work requirements that were written into Medicaid Expansion reauthorization last year were a critical element to get the bill passed and onto the Governor’s desk,” said Morse. It included a work requirement to encourage people to join the workforce while creating exemptions for those who are unable to do so. Sen. Cindy Rosenwald, D-Nashua, sponsor of the bill, said changes are made all the time to these sorts of measures and she felt it prudent to have a backup plan in place. “With the Trump administration’s continued efforts to dismantle the Affordable Care Act, it is incumbent upon every New Hampshire legislator to put systems in place to protect the health and well-being of Granite Staters. Senate Bill 290-FN clarifies and improves the bipartisan work and community requirement. Nothing in this bill will erase the work requirement,” Rosenwald said. She pointed to what can go wrong: In Arkansas 18,000 people have lost health benefits already. Calling a 2018 law a defacto “poll tax” to discourage out-of-state college students and others from voting in New Hampshire, Senate supporters voted 14-10 to pass a bill that separates voting from requirements to register vehicles and obtain a state driver’s license. Senate Bill 67 is considered a “partial fix” to House Bill 1264, which passed last year coupling voting with requirements to register vehicles in the state and obtain driver’s licenses here. Liz Tentarelli, president of the League of Women Voters of New Hampshire, testified in support of the bill previously saying the organization would prefer overturning HB 1264 entirely, calling it a “post-election poll tax” that would ultimately be challenged in court. Republican senators opposed the bill. Sen. Sharon Carson, R-Londonderry, agreed. Carson said New Hampshire has some of the highest rates of voting in the country and there are a lot of states with stricter voting laws for college students. But Sen. Melanie Levesque, D-Brookline, the bill’s sponsor, said the bill reflects an approach by David M. Scanlan, deputy Secretary of State, who charged lawmakers to look at certain aspects of the law that are treating people unfairly. Sen. Lou D’Allesandro, D-Manchester, also supported the bill. Sen. Regina Birdsell, R-Hampstead, said no one is denied the right to vote. “By passing this bill we are saying we have a two-tiered system,” Birdsell said. The Senate voted 14-10 in favor of SB 8, the Independent Redistricting Act. The bill would establish an independent redistricting commission that would draw boundaries for state and federal elections in New Hampshire. Sen. Shannon Chandley, D-Amherst, who sponsored the bill, said she was pleased by the vote. “The will of voters is easily distorted when partisan lines are drawn, and elected officials decide which Granite Staters have the opportunity to vote for them. Our democracy needs a system in which voters choose the candidates – not the other way around,” Chandley said. The Senate also passed on to the House for consideration a bill that would revise the minimum required percentage of renewable energy in the electric renewable portfolio standards through 2040. Republicans said the bill is expensive and there are a number of unknowns in requiring more renewable energy to meet the state’s goals to help reduce global warming. But Democrats said New Hampshire needs to be a leader in combating climate change and this would help step up the pace. The Senate voted 14-10 to pass SB 124, relative to renewable portfolio standards after 2025. “The main mechanism for New Hampshire to reach its goal to reduce carbon emissions is through the Renewable Portfolio Standard (RPS), which requires electric suppliers to acquire a certain percentage of their electric generation from renewable sources. “By strengthening these standards after 2025, SB 124 increases that obligation to ultimately achieve a 60% carbon reduction in the energy sector by 2040,” Fuller Clark said. The Senate passed SB 106 and SB 156, that supporters say will close loopholes in election law and increase transparency and accountability. SB 106 revises the definition of political expenditure and political advocacy organization to require those making expenditures relating to a particular candidate within 60 days before a primary or general election, to disclose who they are, where the money comes from, and what the money is being spent on. SB 156 closes the LLC contribution loophole and requires that a political contribution by a limited liability company be allocated to members for the purpose of determining whether a member has exceeded the contribution limits. The bill now heads to the House of Representatives.